In the Event Library, you can choose to view your Events in a number of ways, including by the date when they were recorded and the disk they’re stored on. If you don’t see the Event Library, click the Event Library button. To view Events by the hard disk where they’re stored, choose View > Group Events By Disk, or click the Hard Disk button in the upper-right corner of the Event Library. 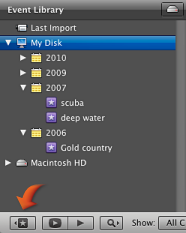 Deselect this option in the View menu, or click the Hard Disk button again, to see Events listed by date. To view Events by the month when the Event was recorded, choose View > Group Events By Month. To see Events listed in descending order by the date they were recorded, choose View > “Most Recent Events at Top.” Deselecting this option in the menu puts the Events in ascending order, with the oldest Events at the top.